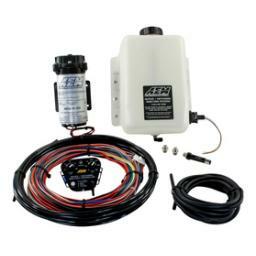 The on-demand progressive controller in AEM’s Boost Dependent PN30-3350 Water/Methanol Injection kit bases injection flow on manifold pressure using voltage input from existing or external map sensor (additional item) to ensure the proper amount of water/methanol injection at all points along an engine’s power curve. The new controller design features large, turn-resistant knobs and larger numbering to easily set accurate start and full activation points, with covered status LED and test buttons for added splash resistance. A plug is integrated into the controller housing for mating to the redesigned wiring harness’s positive-lock connector. AEM’s Boost Dependent, PN 30-3350 gasoline Water/Methanol Injection System’s compact 1 gallon tank includes a high tech conductive low fluid level indicator with a positive lock connector and color matched wires to the wiring harness.